St Leonard’s Church is an Anglican church in Walton le Dale, Lancashire, England, UK. 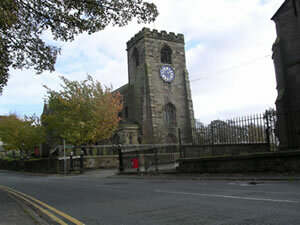 St Leonard’s Church is an active parish church in the Diocese of Blackburn and the archdeaconry of Blackburn. The church has been designated as a Grade II listed building by English Heritage and parts of the church date from the 16thcentury, whereas the nave and transepts were rebuilt in the early 20th century. The St Leonard’s Church Church exists for the people of this parish, to worship God, to welcome new disciples and to work for others through faith in Jesus Christ and the power of the Holy Spirit. WORSHIP-WELCOME-WORK. St Leonard’s Church welcomes everyone to share in our worship of almighty God, which is centred on the Holy Communion, or Eucharist, and in all the other activities in this busy and friendly parish church. Children of ages from 5 to 12 are welcome at the St Leonard’s Church Sunday School JAM CLUB (Jesus and Me). The club is open in term time only and takes place every first, second, fourth and fifth Sunday of the month. JAM Club opens at 9:15am and lasts for 1 hour and 15 minutes. The church has a graveyard. It was founded before 1162. The church is located at OS grid reference SD561280. Benjamin Franklin (one of the Founding Fathers of the United States) visited the home of General John Burgoyne, Preston M.P. 1768-92, at Cooper Hill, Church Brow, Walton-le-Dale in 1771 and 1775. It is believed that he fixed the first lightning conductor in England to the wall of this house. The Unicorn Inn, a 17th century building (now known as Pinocchio's Restaurant) was the posting station used by Parliamentary troops during the English Civil War. The Unicorn Inn was said to be the headquarters of Oliver Cromwell during the battle of Preston. It was later the meeting place of the Jacobites in the area. Thomas Cowpe, a Walton man who joined the Jacobites in 1715, was later hanged at Gallows Hill in Preston. His grave is in St Leonard's churchyard. Tweets about "Walton le Dale"
There are very few industries now left in the village of Walton le Dale. Massy Feeds, who acquired their Mill from Dalgety in 1999, being the largest employer. Well known firms such as Atkinson's Vehicles, Haworth and Airey, J. A. Ley, Calvert's Cotton Mill and Hankin's Haulage have changed, closed down or left the area. Some of the old buildings are being used for new enterprises and the new complex of stores (The Capitol Centre) along the new London Way bypass has altered the area significantly in recent years. Just south of Preston, the village of Walton le Dale, which was known in the Domesday Book as Waleton, lies at the confluence of the two rivers - the River Ribble and the River Darwen. There was a settlement in the area even before the Romans built a camp on their road from Wigan to Lancaster.